As we’ve previously discussed on Dialog Wheel, games don’t necessarily have to be “fun” to be good. I don’t sit down at the end of the day with a novel from James Joyce to unwind, but that doesn’t mean that he doesn’t have something to offer me in terms of artistic value. By the same token, games like Dear Esther stretch our definition of “game”, and offer a different sort of enjoyment in playing through them. Dear Esther is a game determined to make you feel loss, and to ultimately accept that this is an inevitable part of human existence. 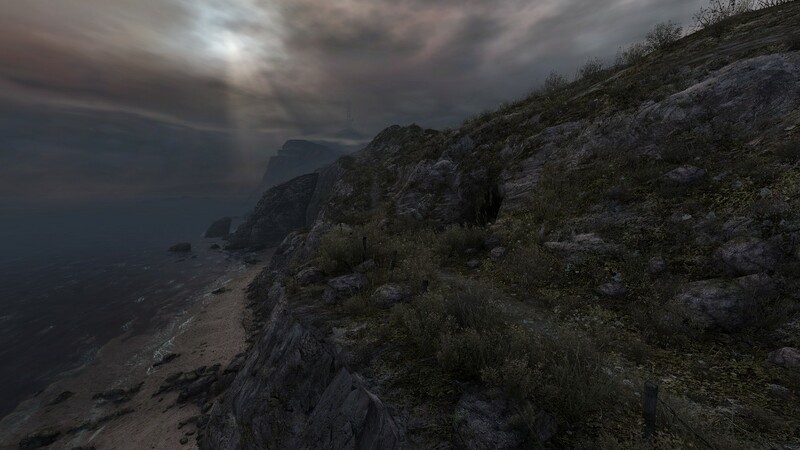 Dear Esther comes from developer The Chinese Room. It was released commercially in 2012, but existed before that as a mod for Half Life 2. The game is very light on mechanics and offers very few opportunities for action. You play in the first person perspective a faceless, nameless, voiceless character who wanders through a deserted island, slowly gathering pieces of a haunting scattered narrative that changes every time you play the game. As a player, you can walk around, you can look around, or you can die. Given these limited options, what follows is a surprisingly compelling game. I found myself intrigued and enthralled by the haunting narrative woven throughout the game, and genuinely invested in seeing how every thing would turn out for the characters within the narrative. The game feels like a first person shooter, but without the weapons, enemies, or danger. By playing with the expectations of the player, specifically building on their expectation of games that use the first person perspective ,the game takes the player from a place of certainty (i.e., the experience of playing an FPS) to a place of uncertainty. By stripping away the familiar trappings of a shooter, and instead placing the player defenseless in a foreign situation, the player is off balanced, and opened in a new way to helplessness. Having played through some of Amnesia, the Dark Descent, and Justine, its strange cousin, I found Dear Esther to be eerily reminiscent of both, and I spent the first 15 minutes or so in fear, expecting a monster to appear. The disorientation I felt never left me, but I grew to accept the limitations of the game. There are no enemies in Dear Esther, so if you die, it is because you inadvertently killed yourself. In the simplest sense, this is the first sort of loss the player experiences: the loss of life by overstepping the game’s boundaries. You can die by falling off of the many cliffs and pits in the game, or by attempting to swim too far from any of the shores. I realized fairly quickly that leaning over the edge of the cliffs to see more of the shoreline would not further my experience in the game, and that there really was no way that you could swim out to the ships and rocks just off the beach. Strangely, the third chapter of the game, the Caves, asks you to forget the only hard and fast rules in the game thus far. In order to enter the Caves, you must jump headfirst into a pit, and to progress, you must dive into water filled pools. My first time through the game, this was completely counter intuitive to me. The game had taught me, “AT ALL COSTS, YOU MUST AVOID THESE TWO THINGS.” Since there were so few actions I could take in the game, it seemed easy to remember the two actions forbidden to me. In forcing the player to pursue actions that would lead to certain death, the game was reinforcing its own lesson in loss: this time a loss of control, and an acceptance of the consequences that follow. The monologues delivered to the player by an unknown character, typical addressed to the titular “Esther”, are interspersed throughout at specific places in the game. They tell several stories, but most of them center around the death of Esther in a car accident. The speaker seems to have come to the island to come to terms with her death. However, as I already stated, these monologues change, and since the game has no linear path to follow, they are not always delivered in the same order. There is no way to save, further guaranteeing that each experience through the game will be unique. By simply playing this game, the player experiences loss: a fragmentation of knowledge, a loss of a complete playing experience. These monologues also suggest a sort of inevitability about the game (and perhaps, by extension, about life as well), since no matter what dialogue you hear, the ending is still the same. This is a game that deals most fundamentally about loss: loss of a loved one, loss of one’s own life, of sanity, of functionality of one’s own body. In the game, this is telegraphed into the final moments of the game, when the player loses control of the character they’ve been playing, and must only watched as they make their way up the tower toward their almost certain doom. This moment represents a culmination of all that the game has been saying. At this point, the player has only one option: to accept this loss and try to understand what follows. Love it or hate it, it is hard to deny that Dear Esther does something exceptional. It attempts to convey an emotional experience not through dialogue, but through gameplay. The player experiences the loss that the narrator feels not because they are told to, but because they themselves experience similar losses. Whether or not it succeeds is still entirely debatable, but its a debate we wouldn’t be having if we only played games that were “fun”.